This might be the easiest recipe I’ve ever tried. Really, it CAN NOT fail. My mother loves merengues very much. We had a family dinner and she asked for something light. I can’t really tell how many merengues you’ll get out of this recipe because it depends on how big or small you make them. 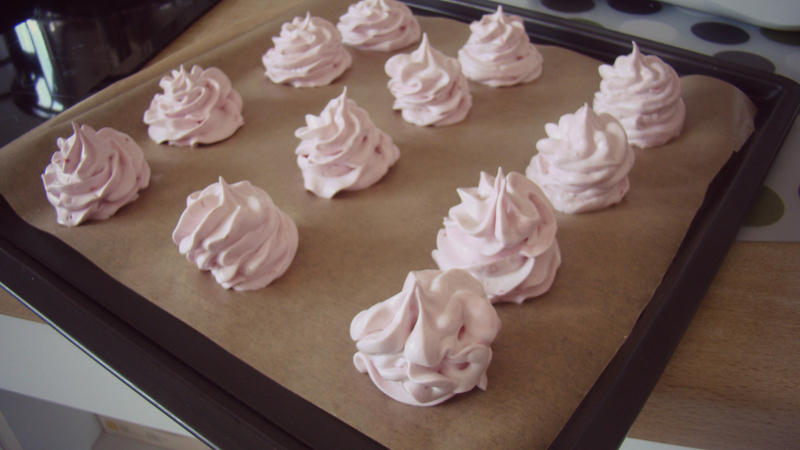 I had 12 merengues with this recipe. First, we mix the egg whites and the salt until you get it nice and fluffy. Then, you add the sugar while you’re still mixing. The sugar needs to ‘stick’. Now we add the raspberries. Make sure they’re cut into tiny tiny pieces. If not, they’ll get stuck in your piping bag and the merengue won’t be able to come out of it. 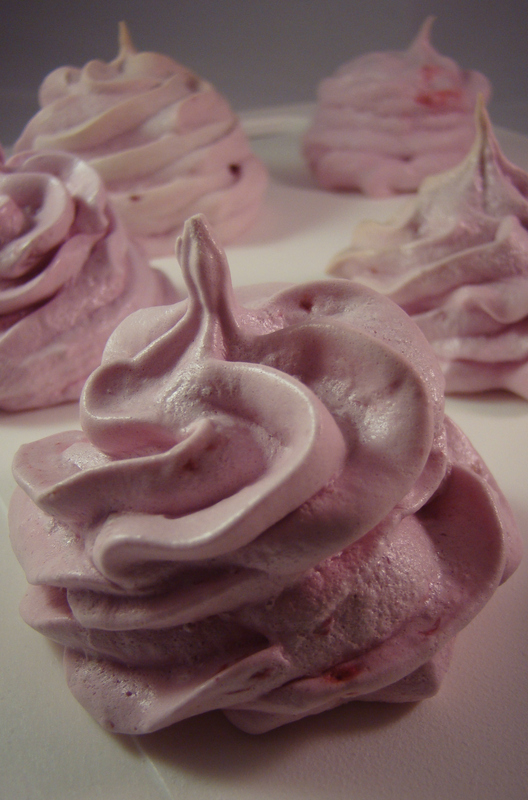 If the merengue is smooth and sticky, it’s time to pipe it! Put some baking paper on a tray. Pipe the merengue in any size you like. Put it in the oven for about 70 minutes on 100°C. When they’re done, check it. A merengue should sound hollow if you tap on the bottom. 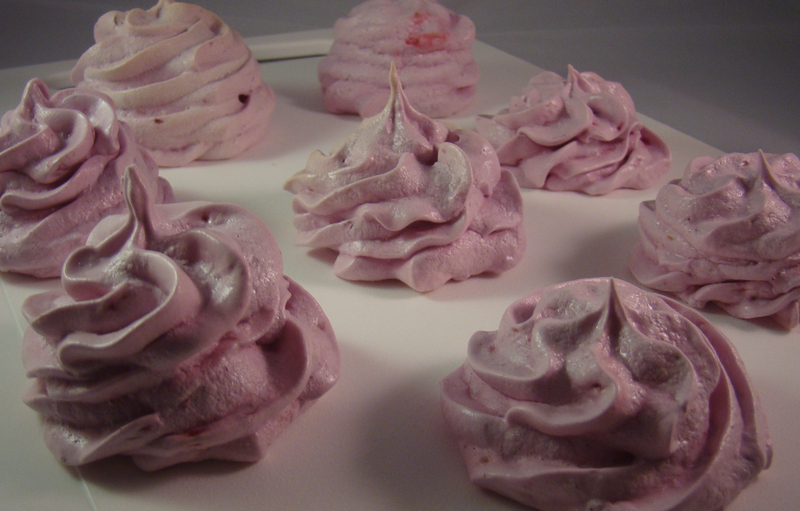 Have a delicious day and enjoy your raspberry merengues! p.s. You can add any flavour you like to the merengue 🙂 Sometimes, it’s better to use a powder instead of a real piece fruit. For example a kiwi. I think kiwis are too liquid to use for your merengues. I have always meant to make merengue but never gotten round to do it because I always say I must plan what to do with the yolks before I start and so I’ve been planning and never starting. I love the raspberry ones. they must taste great! I sometimes just throw them away because I don’t have plans for them either :s thanks!